Puerto Andratx is set in stunningly beautiful surroundings, with cliffs and towering mountains plunging into the clear turquoise seas all around the village. Many visitors decide searching for property finally end buying an apartment or a luxury villa with sea views. Both the coastline and the Tramuntana Mountains provide a wealth of possibilities for walkers and hikers, whether you are hoping to conquer a peak, find a breath taking view point or discover a secluded cove beach to yourself, there are a choice of routes through a range of landscapes to take! Go to properties for sale. Puerto de Andratx is a prestige area and, as such, property for sale in the southwest of Mallorca changes hands for considerable sums. There are few bargains to be sought as can be well understood from the density and quality of much of the extant accommodation. However, its popularity ensures the market remains buoyant and prices stable so investment in Andratx property continues to be attractive for property investors. Much of the available property in the southwest of Mallorca and Port Andratx is luxury villas and apartments with sea views some are great penthouses with large private terraces enjoying fabulous sea views. Those overlooking the harbour are naturally more valuable. There are also a selection of luxury villas and beautiful townhouses for sale on the seafront but these are usually somewhat more expensive. Please see our frontline villas in Andratx here. Sell your villa or apartment with the best real estate network for Mallorca, with a database of over 5000 customers looking to buy property in Mallorca. This website is part of the Balearic Properties Real Estate Network, exclusive for clients looking to buya house, villa or apartment, please contact our friendly team for a free valuation of you property email us or telephone +34 971 53 22 21. The resort is the perfect choice for property investments in Mallorca. Buy a luxury villa with pleasant sea view and a infinity pool is the most demanded by real estate investors. Find over 300 selected detached villas for sale in Puerto Andatx near the yacht club and discover which is your style , wether modern or rustic, with pool or in a development, our extensive range of houses include contemporary villas and stunning properties with sea views. Visit the newly built CCA-Andratx Art Centre and Teatro Argentino where you will get access to a large number of international artists as well as being open for visitors to enjoy one of the largest collections of contemporary works in the Balearic Islands. Most of our villas and country properties have private pools and gardens overlooking the bay . Property here is designed to satisfy the finest and international needs. The main sights of the area are the Castell de Son Mas, the Dragonera Natural Park and the Dragonera Island are natural conservation areas where tourists can get a good feel for the native flora and fauna . For those who love sports, there are excellent facilities for diving, cycling, and golf in Camp de Mar nearby. New added branbd new modern villa in Andratx. See the details here. Close to the marina and one of Mallorca's best and natural harbours, we find the residential areas of Cala Llamp, Cala Cala Moragues, and Monport. Set in this areas we have great developments with luxury apartments and flats for sale with beautiful views. Now there is a brand new opportunity to buy a new project of 14 modern units with infinity pool. Each apartments is sized between 146 and 412 m2 plus terraces. Prices are starting from 1.475.000 Euros . The market in Puerto Andratx is still very attractive for property investors. The most desired holiday resort in Mallorca with over 1000 private villas for rent for holidays make this resort the perfect investment to buy villas in Mallorca, with the best rental income of Mallorca. Port Andratx Properties Available Andratx properties in any budget! 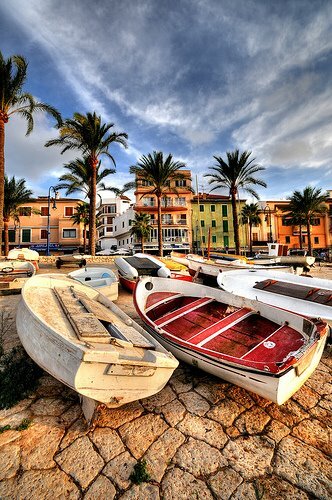 Here we show you the best port andratx property, land and villas for sale in Andratx. From cheap property houses and luxury Andratx Property to undeveloped land property where you can build your own villas. Buying real estate property in Port Andratx can be an adventure; we can make it comfortable for you. Just mail or call for an appointment and we will come back to you in between 24 hours. Mallorca has been since long time the ideal place for property investments abroad, properties have increased vastly in the past years and it has been a great deal for many property buyers until now. Now you have the best chance to acquire bargain properties on the island like never before. Searching your dream property in the sun, now you can afford the majorcan prices due to the financial crisis, please review our property portafolio to find our the best bargains of this month for sale in Majorca. Our property partner Balearic Properties Real Estate Network offer a wide selection of properties for sale in all areas of Mallorca, from a flat in the city center of Palma to the most exclusive waterfront villa at Formentor Bay, in the north of Mallorca. Please visit Balearic Properties in Mallorca Website for more details. Find the most exclusive villas in mallorca with portandratx, your best property website for luxury villlas in Mallorca, particulary in Port Andratx! Mallorca Project Management for building your dream property in Majorca. LF91 is the best company for coordination and control of the development of the building work . Together with a team of professionals LF91 is delivering the best advice and support for property construction since 1999.